If you’ve played video games, you know this game. It’s the grand daddy of them all; the game that revitalized all of video gaming and propelled the NES into the craze it became (and remains to this day). It’s Super Mario Brothers! 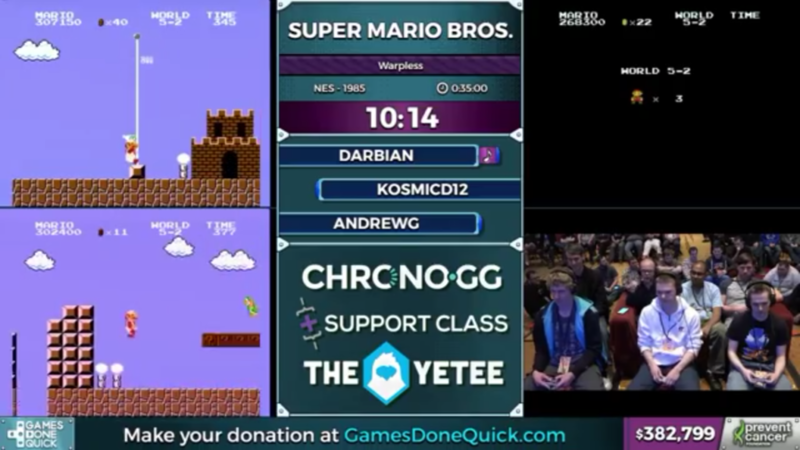 Speed runs of Super Mario Brothers are interesting, for similar reasons to the Ocarina of Time runs. Due to the immense popularity and fan love for these games, speed runs are plentiful and constant. For these reasons, people have found insane tricks that shorten the game to under 10 minutes. On the flip side, this doesn’t show off a lot of the game. One of the best parts of Super Mario Brothers is the technique and finesse required to speed through a level. Mario speed running is at its best (in my opinion) when showing off a runner’s mastery of the game, rather than some huge skips. This is the entire reasons we have categories like Warpless. Our three runners will be racing to the finish, but without utilizing warp pipes or major skips. It’s a race about pure technique and ability, not just glitch execution. It’s going to be a fast paced run, so I’ll do my best to give you a solid over view of the skill shown off in the race. One thing to note before I talk about any specific moments is that the runners are all usually slightly different strategies. For instance, Kosmic is choosing to remain small Mario throughout the run, avoiding power ups along the way. 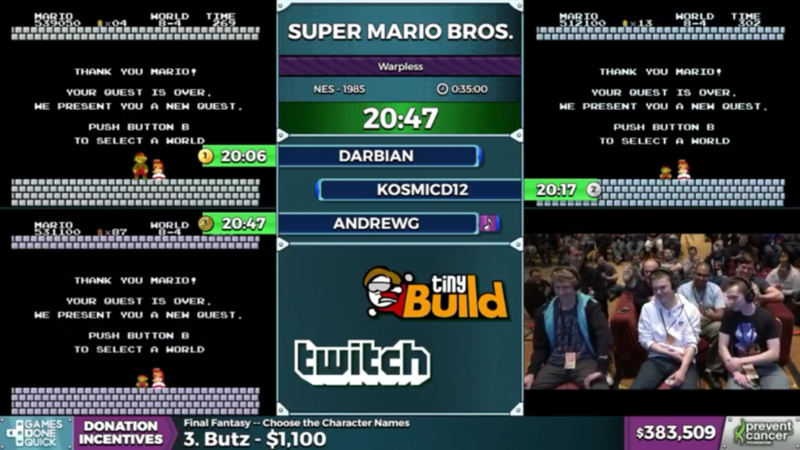 Alternatively, both Darbian and AndrewG will be utilizing Fire Flower Mario. Both strategies have advantages and disadvantages; Kosmic won’t have to pull off difficult “crouch jumps” due to being small, but loses the safety of projectiles that Andrew and Darbian have. One major time saving difference occurs in Bowser fights, as defeating Bowser with the Fire Flower power up skips a cut scene. Kosmic is basically going for a risk-reward strategy, while Darbian and Andrew play it a bit safer (with their own advantages as well). 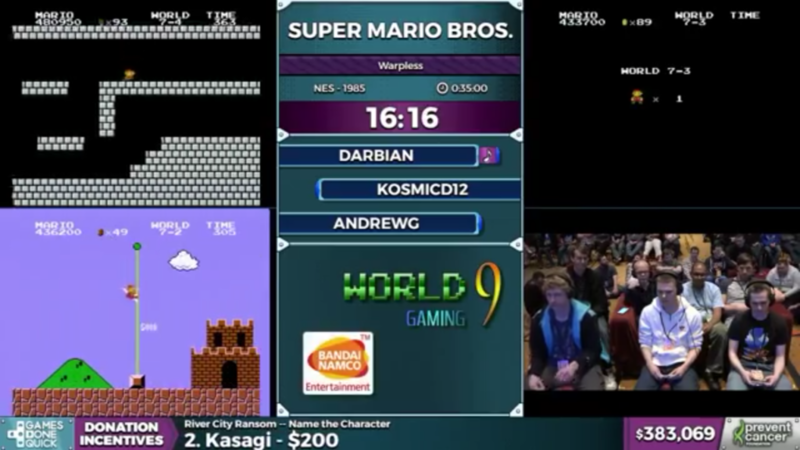 World 1 goes well for all runners, with only some minor hiccups. 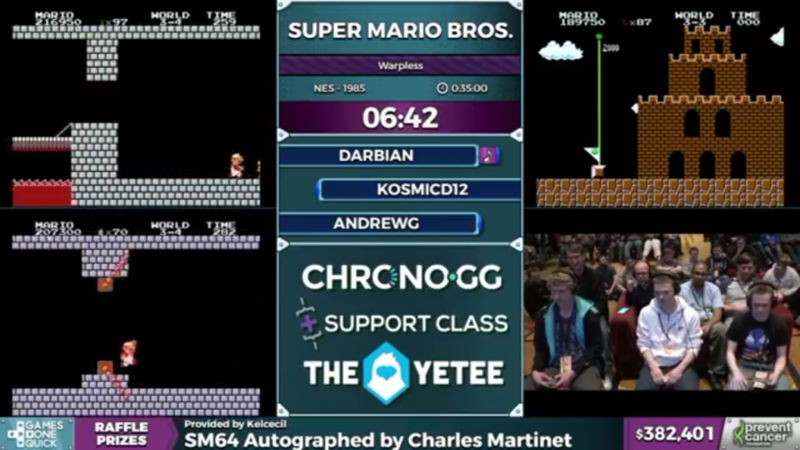 Kosmic holds a pretty decent lead (small Mario is working in his favor) heading out of the Bowser fight. However, the amount of time Darbian and Andrew save by skipping the cut scene is significant. This significant time save in one big chunk could be a game changer as the race continues. I also can’t understate just how well the runners perform. You know how great it feels when you run straight through a level of any Mario game, without stopping? You feel like some sort of gaming deity (at least I do). Watching these guys perfectly jump and never lose momentum recreates that feeling in triplicate. World 2 provides a lead change, as well as a pretty good explanation of the fireworks mechanic. Kosmic dies early in World 2, and loses his lead to Darbian. Dying in a Super Mario Brothers speedun loses a lot of time; both Andrew and Darbian end up almost a full level ahead of Kosmic after his death. As I just mentioned, World 2 is where we start to see some manipulation of the clock to avoid the congratulatory fireworks occasionally seen after beating a level. These fireworks are triggered by beating certain levels with a time ending in 1, 3, or 6. With that knowledge, all of the runners intentionally slow down or adjust their speed to avoid getting fireworks. 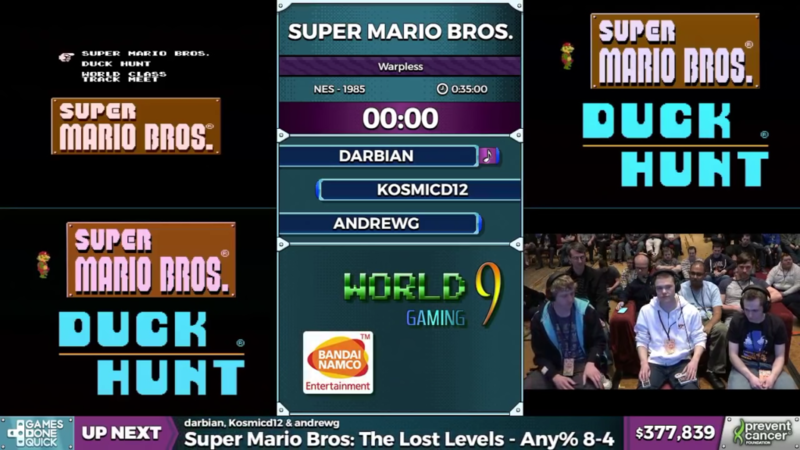 As the race progresses through World 3 and 4, Darbian and Andrew stay pretty close to each other. Kosmic struggles to close the gap caused by the World 2 death. Overall, the theme of this run seems to be on small time savers. As I had previously explained, the Warpless category is less about giant skips and more about subtle finesse. The runners attempt to pull off small tricks that save portions of seconds, hopefully adding up to some decent time saving over the run. These tricks are seen all over the place, such as turning backwards to improve speed, as well as approaching the level ending flag pole at specific angles. These tricks, combined with risky strategies that save less than a second, truly capture the difficulty of this category. As we pull through World 5, 6, and 7, now is a good time to bring up the frame rule. Super Mario Brothers speed runs are constantly running an internal clock, knowing what frame they are on as they play. Every 21 frames, there is a perfect window to end the level and save the maximum amount of time. The key is to approach this window one frame early, but missing it can cause you to lose optimal time. It’s another small time saver that make barely noticeable small term changes, but can make or break a win. As far as the standings, Darbian keeps his lead throughout World 6. On the Bowser stage of World 6, Andrew takes a risk to get him closer to the lead, and fails. This actually pushes him into the third place, with Kosmic’s small Mario strategy boosting him into second place. With World 7 and World 8 being mostly glitchless, it’s looking like the race will be wrapping up pretty soon. The majority of this race was flawlessly executed sans a rogue death or two from Kosmic and Andrew. If anything though, this race goes to show just how precise Super Mario Brothers speed runners have to be. It was an excellent display of skill and comprehensive understanding of the game’s mechanics. I highly recommend checking out the full run!